Rent cars often? Borrowing a friend’s ride? Since driving your car without car insurance is illegal, you may be wondering what happens when you end up having to drive a car that isn’t yours. Many people could find themselves in this situation when they’re taking care of a friend for a short period of time, or when they’re house sitting and using the owner’s car for a few days. Non-owner car insurance provides some protection if you end up being in a car accident, but also has its limitations. Read on below to learn the ins and outs of non-owner car insurance. 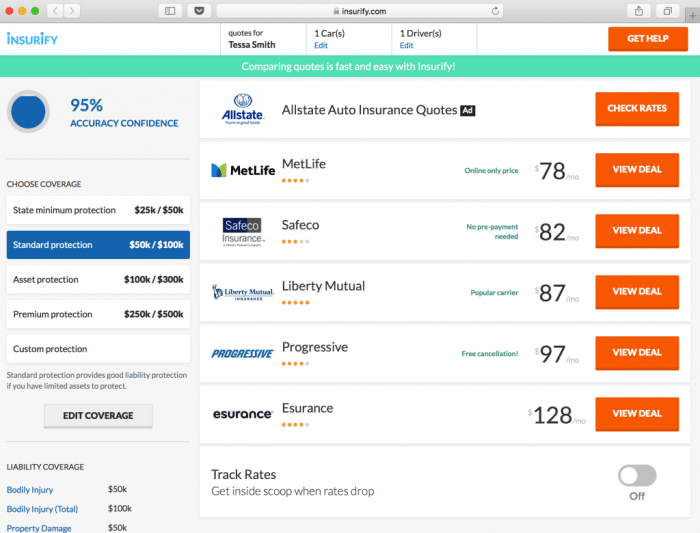 Insurify can help you compare car insurance quotes instantly. Auto insurance rates can be impacted by any number of reasons: your driving history, your age…even where you live. So if you are a car owner looking to save up to hundreds on your car insurance premium, let Insurify run the quotes for you, and match your driver profile to top national and regional carriers. Join the hundreds of thousands of drivers nationwide who have already compared, switched, and saved using Insurify! However, if you’re looking into an insurance policy that offers you motorist coverage if you’re not a vehicle owner (and are sick of the higher rates that car insurance companies are offering), read on. Here’s what every driver needs to know about non-owner auto insurance. Why buy non-owner car insurance? It’s important to understand that non-owner insurance only provides liability coverage for the policyholder. It does not provide full coverage like collision and comprehensive insurance—you will need to be on the car owners policy for that type of coverage or carry other types of insurance for the car you’re driving. Non-owner car insurance policies typically only cover the cost of any property damage you cause or injuries to other people in the accident, but not for your passengers, yourself, or your car. When you buy this type of insurance, you will have the minimum coverage amount required by your state, but can choose higher minimums to provide extra protection. In some states, you may need to be insured on the car owner’s policy instead of having non-owner car insurance coverage. You’ll need to check with an insurance agent to determine what you are eligible for and the type of coverage you truly need. One thing to remember: If a family member in your household owns a vehicle and you end up driving it without having your own auto insurance policy, you will need to be listed on the auto policy as an insured driver. Do I really need non-owner car insurance? Driving a rental car frequently and not having coverage through the rental company or your credit card company. Driving a friend’s car for more than one occasion (perhaps you have regular access to their vehicle), a road trip, or other reasons. Protecting your driver risk status when driving someone else’s vehicle. Preventing a lapse in car insurance coverage which could prevent higher insurance premiums in the future or even being denied coverage. Using any type of car-sharing service. Some cities have well-established car-sharing services that make it easier to travel without owning a car. However, this can also increase the risk of getting into an accident. If you plan on using any of these services, you’ll need a non-owner policy to supplement the liability insurance coverage the car-sharing service provides. Having protection from uninsured drivers. If you live in an area replete with high-risk drivers, this could be even more important. If you are driving someone else’s car and someone else causes an accident, you are covered for bodily injuries and property damage of the vehicle. Most car insurance companies don’t offer a quote for non-owner car insurance online because it’s a specialized type of insurance policy. You may need to call an insurance agent directly to get a quote or visit a local office to purchase your policy. How much, though, does non-owner car insurance cost? It’s interesting to note that non-owner policies are usually less expensive than standard car insurance policies. This is because they provide far less coverage and you would end up paying a lot more out-of-pocket in the event you were involved in an accident. The insurance company wouldn’t pay for any vehicle repairs or replacing your vehicle if the car was totaled. Another reason why these types of policies are less expensive is that insurance companies assume you won’t be driving the vehicle frequently or for long periods of time. Since there’s less of a risk of you getting into an accident, the insurance company is willing to take a chance on you. One thing to remember when applying for non-owner car insurance is that you can’t hold this policy if you technically have access to a car where you are already insured on a policy. For example, if you are living with your parents or with a roommate who has a car and you drive the car occasionally, you wouldn’t be eligible for a non-owner policy. The insurance company will make you ineligible for non-owner car insurance because you do have access to a car and are insured on someone else’s policy when you drive it. Getting a non-owner insurance policy is a smart move when you don’t have access to a car and are using someone else’s car—not a family member or roommate’s car—more than a few times on a temporary basis. It gives you some peace of mind knowing that you will have some protection in the event of an accident with an uninsured motorist or if you end up hitting another driver. However, a non-owner insurance policy is very limited in scope and is best used in less serious accidents or incidents. Premiums and coverage amounts are lower than traditional policies because insurance companies simply think that there’s less of a chance of you getting into an accident when you are only driving the car for a short period of time. Still, it can be valuable to have this type of coverage when you are renting a car and driving in a new area, using a car-sharing service, or if you want to avoid a lapse in auto insurance coverage. Not all insurance companies offer this type of coverage online, but you can request quotes over the phone or in person. Starting your search for the right company with an online auto insurance quotes comparison platform like Insurify can be a simple first step, no matter your driving record or financial situation. Insurify’s already covered drivers from Maine to California, from Florida to North Dakota–if you’re a car owner, join the Insurify movement and start saving today!